The Kalahari Desert is a large, sandy plain in southern Africa with forested regions in its northern reaches. Really a semidesert or dry savanna rather than a true desert, the Kalahari measures about 1,000 miles from north to south and 600 miles from east to west at its broadest points. About 100,000 KHOISAN people and approximately 1.5 million BANTU-speaking people live in this area. 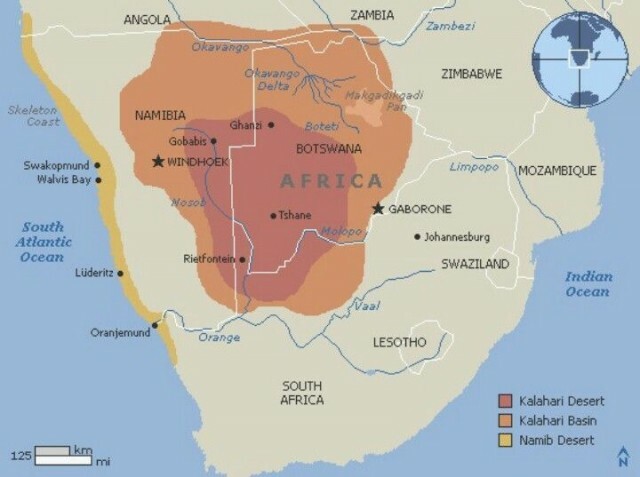 The Kalahari covers most of the nation of BOTSWANA, the eastern part of NAMIBIA, and parts of southern ANGOLA and northern SOUTH AFRICA. Much of it is covered by deep sand, which in many places is red. The western part consists of row after row of long sand dunes ranging from 20 to 200 feet high. The Kalahari also features pans—hard, white, flat areas that resemble dry lakes. They are formed by streams that flowed during a wetter period in the region’s history or that still flow briefly after rainstorms. The most desert-like part of the Kalahari is in the southwest, where it blends into the Namib Desert. Less than 5 inches of rain falls annually in this area, limiting plant life to thin, drought-resistant brush. Animals of the southern Kalahari include herds of springbok, wildebeest, and hartebeest—which are all types of antelope. The northeastern Kalahari receives up to four times as much rain as the southwestern region. In addition, the Okavango River carries rainfall from central Angola into the northern Kalahari, where it fills a network of swamps. Vegetation ranges from grasslands and some trees in the central Kalahari to forests and water plants in the north. Elephants, zebras, giraffes, antelope, lions, cheetahs, warthogs, baboons, and other animals live in the northern Kalahari.